LEAD JUDGMENT BY: JAMES SHEHU ABIRIYI, J.C.A. This is an appeal against the decision of the High Court of Adamawa State. The facts of the case are that the Appellant advertised for the construction and repairs of its light aircraft runway to meet the standard specifications laid down by Nigeria Aviation Authority. The contract was awarded to the Respondent. But the Respondent failed to construct the runway in accordance with the terms of the contract. Apart from this, the Respondent used the Appellants machineries and equipment and did not pay the Appellant N17, 200, 000.00 for the use of the equipment. When Respondent’s solicitor asked Appellant to pay the Respondent outstanding contract sum of N103, 060,315.10, Appellant’s solicitor replied that the Appellant had engaged a third party to construct and bring the runway to the standard specifications laid down by the Nigerian Aviation Authority. N82, 737,375.00 was paid to the third party. According to the Appellant, the failure of the Respondent to execute the contract as specified caused it to spend N50 Million on transportation from Yola Airport to its factory in Numan Adamawa State. The Appellant denied agreeing on the extra work and cost of N121, 148,100.20 with the Respondent. 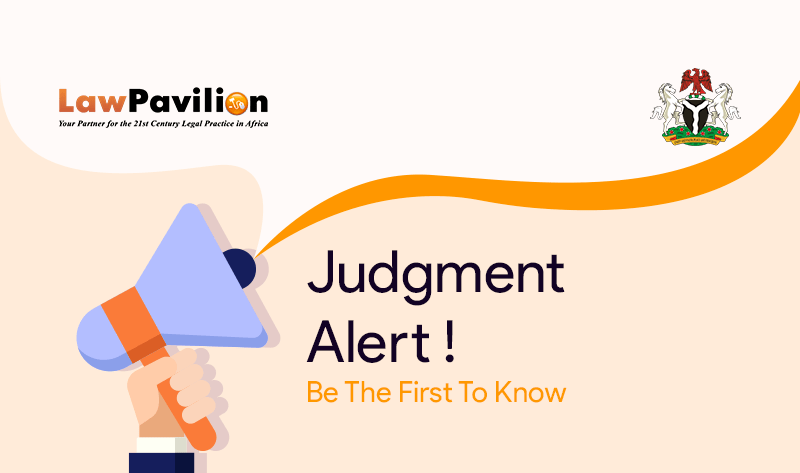 The Appellant’s Consultant issued a certificate of completion of the project to the Respondent without a joint inspection of the runway by all parties. PW2 who attended Court on subpoena stated that the Appellant was not given certification in view of defects they observed on the facility and equipments. The salient defence of the Respondent and evidence in proof of its counterclaim included the following: According to the Respondent, it completed the contract in line with the terms and conditions of the contract. The Consultant wrote to the Appellant informing it of fresh instructions it gave to the Respondent. The Respondent requested for additional advance payment of N60 million from the Appellant as a result of the extra works that the Consultant introduced and increase in rates of asphalt. Extra works executed by the Respondent at the instance of the Consultant cost N121, 148,100.00. On the 30th June, 2014, the Respondent submitted the bill for the extra works of N121,148,100.20 arising from the instructions of the Consultant appointed by the Appellant. On 18th May, 2016, the Appellant wrote to the Consultant informing him that the Respondent had completed the work since 14th May, 2016 and notified the Consultant so that he could issue a final completion certificate. That the Respondent had to rent the Appellant’s machines because of the extra works on increase of the length of the runway added by the Appellant to Respondent in the Consultant’s instructions. That the Respondent having been issued with the certificate of completion by the Consultant, was entitled to the outstanding balance of payment. In its efforts to recover the outstanding sum of money on the contract the Respondent engaged the services of a solicitor who charged it N22, 920,841.55 as solicitor’s fee. The purported inspections were done after the Respondent had issued a demand letter for the balance of the outstanding contract sum. The Respondent duly and satisfactorily completed the contract for the reconstruction, rehabilitation and renovation of the runway as agreed by the parties. The Chief Pilot and his colleagues from Dangote Group of Companies after inspection confirmed that the runway met the standards of their operations. The observation of Nigeria Civil Aviation Authority officials bordered on the equipment for the operation of the runway and not in respect of the contract between the parties which was limited to reconstruction of the runway. The Appellant first took out a writ of summons with Suit No. ADSY/58/2017 against the Respondent before the Respondent in turn took out a writ of summons with Suit No. ADSY/69/2017 against the Appellant. Both suits were consolidated and the Appellant remained the plaintiff. The Respondent became the Defendant/counterclaimant. The claim of the Appellant was for a declaration that the Respondent failed to construct an aircraft runway that meets the standard specification of the Nigerian Aviation Authority and failed to do so on the date agreed to by both parties, an order for the payment of N50 Million being cost on transportation of Respondent’s staff from Yola Airport to Appellant’s factory, N50 million general damages, interest on the sum of N50 Million at the rate of 21% and costs of the action assessed at N20 Million. The claim of the Respondent against the Appellant which became its counterclaim after the consolidation of the two suits was for the sum of N229, 208, 415.50 being balance due on the contract sum for the reconstruction, rehabilitation of the runway and extra works, damages for trespass and costs of the action. After considering evidence led by both parties, the High Court dismissed the claim of the Appellant and entered judgment in favour of the Respondent/counterclaimant. Dissatisfied with the decision, the Appellant appealed to the Court of Appeal. ISSUE 1: Whether the Court below construed and gave effect to the clear and express provisions of the contract between the parties contained in Exhibits BB1 and C.
ISSUE 2: Whether the learned trial judge was right to have granted the Respondent’s claim for special damages in the sum of N22, 920,841.55 while refusing the Appellant’s claim for the sum of N17,200,000. ISSUE 3: Whether, from the totality of evidence and materials adduced at the lower Court, there is any contract/agreement between the parties hereof on the sum of N121, 148, 100 as cost of extra – works claimed by the Respondent and granted by the lower Court. On the whole, the Court allowed the appeal in part. The claim of the Appellant in the High Court was dismissed in its entirety. The counterclaim of the Respondent for the sum of One Hundred and Twenty One Million, One Hundred and Forty Eight Thousand, One Hundred Naira and Twenty Kobo (N121, 148,100.20) only for extra works was also dismissed.